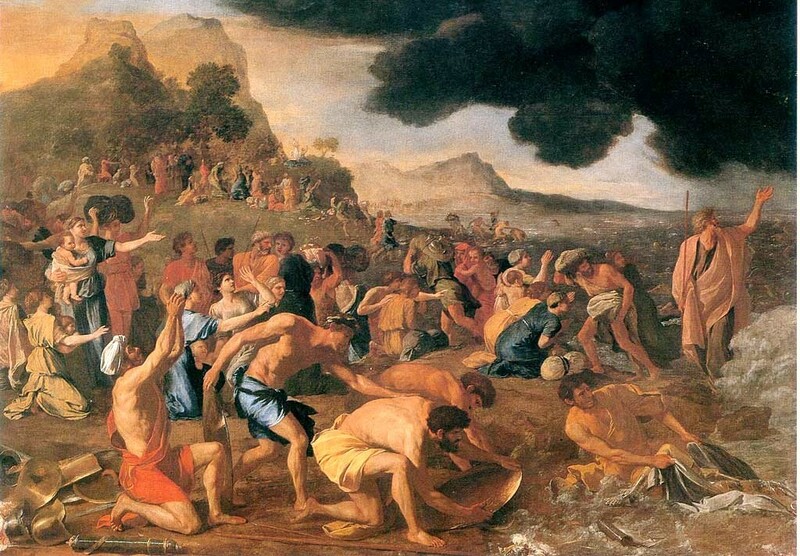 On the penultimate day of the Passover Holidays (which is called Shvii shel Pesach – the Sevenths Day of Passover), we read in the Torah about Kriat Yam Suf – splitting of the sea. The Talmud (Yerushalmi Pesachim) and Midrash (Pirka deRabeinu Hakadosh) tells us that at that dramatic moment, when the Jews, who just escaped Egypt, were trapped between the sea and the Egyptian army pursuing them, the Jews were divided into four camps (so many Jews and only four opinions?! ), each advocating a different course of action: one group proposed to wage a war with Egyptians; the other group wanted to jump into the sea; the third group advocated prayer and the fourth insisted on returning to Egypt. Classical commentators relate these four proposals to four different modes of interaction between Jews and their non-Jewish environment. Jumping in the sea signified immersion in the Torah to the exclusion of any secular influence, sticking together as a community of holy people in pure environment, self-segregated in a ghetto. Engaging Egyptians on a battle field signified going out of the ghetto and engaging secular world although that may entail a battle that cannot be always won. The third opinion signified passive approach, an attempt to influence the world through prayer. The last approach of returning to Egypt signified returning to slavery. What does it all have to do with Physics – the subject of this blog? In physics we also have different forms of interactions – coincidently also four. They are called fundamental forces: strong nuclear forces, week forces, electromagnetic and gravitational forces. It struck me this year during the reading of this Torah portion that it may not be a mere coincidence that in both instances there are four fundamental modes of interaction but that the analogy may be deeper than that. At the first blush, based on the pshat (literal meaning), waging a war appears to be a strong response parallel to the strong forces (indeed, the binding energy of the residual strong force is in nuclear weapons). Jumping into the sea in an act of mass suicide sure seems like the weak cap-out parallel to the weak forces (a.k.a., beta-decay further amplifying the parallel with the suicide leading to decay). However, on the level of drush (homiletic exposition) the correspondence turns out the opposite (perhaps there is a hidden symmetry between strong and weak forces yet to be discovered). The first mode of interaction – jumping in the sea – corresponds to strong interactions between elementary particles. Strong force binds subatomic particles – protons and neutrons – together in a nucleus of an atom; it also glues quark together to form protons, neutrons and other particles. This was the idea that, according to our Sages, has been advocated by those who suggested jumping in the sea – keeping together as single community, single nucleus surrounded by water (euphemism for the Torah) that glues us together. The second mode of interaction was to go outside the camp to engage in a battle. This nay may be parallel to the weak interaction involved in beta decay. Beta decay is a radioactive process when a nucleus emits a beta particle (electron or positron). This reminds me of shooting canons or, perhaps, troops leaving the base to attack the enemy. This quantum-mechanical interaction governs decay of particles that break up and emit other particles. Breaking up the traditional lifestyle and going out of the ghetto or out of their camp to engage the enemy on a battle field is symbolic of new particle being emitted in radiation as a result breaking up of original particles. The third approach was to pray. The prayer is symbolized by the Jacob’s Ladder depicting angels going up and down the ladder carrying prayers up to God and bringing back His blessings. This may be symbolic of electromagnetic interaction which has two modes attractive (electron-positron pair) or repulsive (electron-electron pair). Attraction and repulsion modes of electromagnetic forces are symbolic of kabbalistic concepts of rotzuv v’shov – running and returning, which underline the mystical nature of prayer. Lastly, the return to Egypt signifies gravitational forces – attraction to the source. The Hebrew word for return is “teshuvah” which can be broken into “toshuv heh” – a kabbalistic concept of returning the last letter heh to God’s name Yud-Heh-Vav-Heh – Tetragrammaton. The last letter, heh, represents the sfirah of malchus. Earth also represents malchus, hence connection to gravity. Every object thrown upwards returns to Earth because of gravity. As we see, the four modes of interaction between Jewish people and their environment correspond to four fundamental interactions-forces in physics. Steven Weinberg, Abdus Salam and Sheldon Glashow received Nobel Prize for electroweak theory unifying electromagnetic and weak forces. Murray Gell-Mann won a Nobel Prize for his contribution to quantum chromodynamics (QCD), the theory of strong interactions and the standard model unifying the electroweak forces with the strong nuclear forces. Had the Nobel Price existed in that time, I am sure, Moses would have gotten at least the Nobel Peace Prize for unifying four groups of Jewish people each pulling in the other direction. Ultimately, all four opinions turned out to be misguided. God said to Moses, “Speak to the children of Israel and let them move on.” If you can interpret this in terms of quantum field theory, perhaps a Nobel Prize awaits you for discovering the unified field theory, a.k.a. The Theory of Everything.